While New Jersey’s Black Bear population is concentrated more in the northwest corner of the state, they have expanded their territory over the years and have wandered practically all over the state, showing up at times here in Union County. Because bears occasionally do show up, residents are cautioned to avoid approaching any bear and contact authorities immediately. Bear problems are handled by the State, with the following information provided by the New Jersey Department of Environmental Protection. 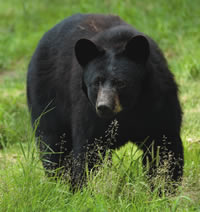 Black bears are the largest land mammal in New Jersey. They are an integral part of the state’s natural heritage and a vital component of healthy ecosystems. Since the 1980s the Garden State’s black bear population has been increasing and expanding its range both southward and eastward from the forested areas of northwestern New Jersey. Within the most densely populated state in the nation, black bears are thriving and there are now confirmed bear sightings in all 21 of New Jersey’s counties. Division of Fish and Wildlife personnel use an integrated approach to managing New Jersey’s black bear population, fostering coexistence between people and bears. 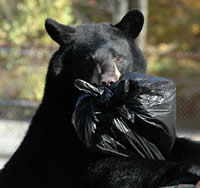 The most common bear problem New Jersey’s residents experience is black bears getting into their garbage. Bears are attracted to neighborhoods by garbage odors, so properly securing your garbage is one of the best ways to prevent bears from becoming a nuisance in your community. Residents are encouraged to work within their community to make sure all garbage is secured and kept away from bears. For tips on proper garbage management and coexisting with bears, click here.